A few years back, I started using Hands-On History: Explorers by Michael Gravois to use with our textbook to make things more hands-on for my early explorers unit. I also use his Colonial and American Revolution ones as well. 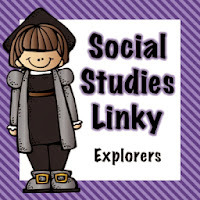 The first activity that I use is the Seven Reasons for Exploration activity. You start by making a cute mini-book out of a sheet of paper. Here are the visual steps. You can use this book for anything! After filling out each reason (curiosity, wealth, fame, religion, national pride, better trade routes, and foreign goods), students glue their booklet on the first page of their explorer notebook and title and decorate it. I love those little mini booklets! Great instructions too. :) Thanks so much for stopping by my little blog. Hello! Thanks for stopping by my blog and leading me to yours! I am going to have to try out some of your foldable ideas! I'm also your newest follower! I am looking forward to making one of those mini-books for my next Social Studies unit on WWI. Thanks for the share!